Arno: could someone please explain me, why ordinary minimal kos have a value of 1/3? I haven't got the knack of miai counting yet. The difference between winning and losing the ko is 1 point. There are 3 moves between the winning positions, 1 move for each player to win the ko and 1 move to take the ko. So each move is worth 1/3 point, on average. Es claro? 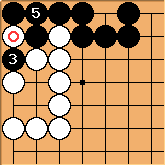 ... if white plays, she has invested one move more than black (i.e. 1 white move, 0 black moves). If black plays, he has to capture and connect (=2 moves) while white does not play there (=0 moves). Therefore, black played two more moves than white. A possible ko-threat play by White is not counted, because it is outside this position. Thus the difference of the possible outcomes is 3 moves and 1 point value, thus a miai value of 1/3. Alistair Turnbull: Furthermore, it doesn't matter how long the ko fight continues, because in each capture-threat-answer-capture-threat-answer cycle the two players play the same number of moves. Now there is an even chance that white will play next. Define the result to be net 0 points difference. The alternative is that black eventually wins the ko, and gets +1 point as a result. If, at each move, it is an even chance that either white or black will play again locally, the chance that black wins the ko immediately is 1/4; that white wins immediately is 1/2; the remaining 1/4 of the time, black plays and then white plays, so that the original situation is restored. Thus, when we sum the infinite series, we get a total chance of 2/3 that white wins, and 1/3 that black wins. Thus the current result gives white a disadvantage of 1/3 point from the 'reference' position where white has won the ko. Thus, playing locally is worth 1/3 point for white. Symmetrically, it is worth 1/3 point for black, since the black play would shift the value from 1/3 to 2/3 in black's favour (the value would become 2/3 since it's 1/3 less than the +1 value for black winning the ko - 1/3 less by the same argument as above). MK In fact this reasoning nearly convinced me. Could you please make the 'infinite series' part clearer? victim 1/2 - 1/4 + 1/8 - 1/16 + ... = 1/3. 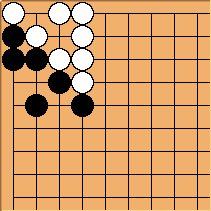 Another way to come to the same result: Let's call the position where Black can capture or White can connect, B. If White connects, we get zero. If Black captures, we get a position we call W, where Black can connect or White can capture. So B = 0 * 1/2 + W * 1/2, if the probability is 1/2 for each outcome. Similarly, for the next move, W = B * 1/2 + 1 * 1/2. Now we have two equations with two variables. By the way, this is not as useless as it seems to be at first sight. The computation works the same way for a bigger ko. So, as a first estimate of how big capturing a ko is, compute the difference between "White wins" and "Black wins" and multiply by 2/3. If you don't have much time, play a gote move bigger than that rather than playing the ko. Of course the number changes if it's a two-stage ko. Capturing or connecting here is worth the same as two points in gote, as an approximation. Use the same methods as above to calculate that. RafaelCaetano Karl, I agree that you make it seem more complicated than it is. :-) I don't see why introduce probabilities and infinite series here. I find Bill and Arno's reasoning convincing enough. But since some people don't, I'll try a simpler approach. Actually I read it somewhere else a long time ago, probably r.g.g (maybe by Bill?). Consider the following position. Black plays first. White connects, since it's no use to fight the ko. Black 3 also connects (below 1), since again it's useless to try to win both kos. Finally White connects. Black got a stone, that is, 1 point. White plays first. Again, after Black captures with 2, White simply connects the other ko. Black 4 below 2. Again Black got 1 point. So the value of the position above is 1. Therefore, the value of each of the 3 kos is 1/3. Is this reasoning correct? It looks so simple that I feel something is missing. victim It's fine. Of course one has to remember that it's still an approximation. Bill: It's not just an approximation, as Rafael's example shows. If there is one such ko, the final territory result will differ by one point depending on who wins the ko. But when there are three kos, as in Rafael's diagram, the result is the same, no matter who plays first or how many ko threats any player has. If the value were simply an approximation, there would be a range of results with three kos. Alistair Turnbull: Well, Rafael's example shows that the exact value is some game G such that G+G+G = 1. It doesn't show that G is a number. Or am I missing the point? Karl Knechtel: Is it possible for a scalar multiple of a game that's not a number, to be a number? If not, there would seem to be no problem. Bill: No, it does not show that G is a number, but that is not the claim. We are finding the average value of G.
BramGo: I'm sorry to tell you, in my opinion there's a mistake in the calculation. Yes, if black starts then he captures 1 stone. But he also captures 1 stone if white starts. So in miai counting we now have to take the difference in points of the 2 final positions. The difference is 0 points, because the score is exactly the same in both resulting positions. So, the total value is not 1, but the value is 0. That means that black or white's first move has no value at all. Why not ? - Because as you can see it doesn't matter who plays first, it results in the same score. BramGo: Bill, I realize now, that I was applying Deiri counting. The reasoning on this page appeared totally flawed to me. But now I realize that miai counting works differently. Bill: Actually, BramGo. Both deiri counting and miai counting are irrelevant to the discussion of Rafael's diagram. All we are talking about is the average territorial count, not the value of a move. TriumShockwave? - Frequently in pro games I see these kos left unresolved at the end of the game. Are they counted as a point for the player who currently has them surrounded, or are they uncounted as a dame like in seki? Mef: The point from these kos comes from capturing the opponent's stone for the last time, so it doesn't really matter if it's filled or not, just so long as they know who captured. last. I guess to answer you question, it would be considered dame. Bill: They are not left unresolved at the end of the game, it is just that the final ko fight is not shown in the published game record. The text tells us who wins the ko. If that information is not in a comment, it should be decipherable from the score. Bill: Depending upon komaster, there are kos worth 1/4 and 1/5 point. I constructed the 1/5 point ko; 1/4 point kos show up occasionally in real games but are unrecognized as such. Bob Myers: Where are these documented? Bill: I misspoke. There are 1/4 point ko positions. (By the time a ko has appeared, the ko is hotter.) Here is an example, with Black komaster. Black has gained 1 point with 4 net local plays, each worth, on average 1/4 point. 1/n point "ultimate gote" endgame? If black is a komonster, and is able to win the ko n (or so) times so that he can connect at all the n (or so) places along the side, then gains a point with n (or so) moves. Maybe I used some premises not needed for the 1/4 point situation? Or maybe I am counting the "white first" position wrong? RobertJasiek: The position makes a nice external ko though. tapir: You are joking aren't you? If White is komaster she will capture those four stones and some more. How will you ever arrive at an average 1/3 pt. gain? tapir: I know, I posted what I believe is a very similar example on this subpage of mine. Still you use the difference between Black winning and White winning the ko to arrive at the net count and divide that through the local tally. At least that is what you have done elsewhere. Even only considering it as a two stage ko and resolving it by capturing 4 stones results in >10 points difference, disregarding all the rest, even this is much more than 1/3 pt. per move, and being able to capture more after resolving the ko as White certainly does not cool it down to 1/n or 1/3. Question about ko in AGA (or Chinese) rules: I was reading through Generalized thermography: Algorithms, implementation, and application to Go endgames ( abstract, text, examples) by Müller, Berlekamp and Spight, and I came across this statement: In Chinese Rules, dame and one point ko fights are both valuable but incomparable plays. Playing them in the right order can already be quite intricate. The reference is to a Ph.D. thesis I cannot find anywhere online. Thinking about it, I cannot come up with any situation where playing dame is preferable to filling or capturing a ko, whatever the ruleset. Does anyone know a situation where this happens? Herman: Suppose that a is the last half point ko, and b is the last dame in the 5x5 game. There is no komi. Black to play, a or b? Black has 12 points, white has thirteen, white wins by one point. Black has thirteen points, white has 12, black wins by one point. So, the correct way to play is to take the dame instead of filling the ko. With already there, doesn't work. Here, black has 11, white has 14, so white wins by 3. RobertJasiek: Also see Ko and Dame Endgames.